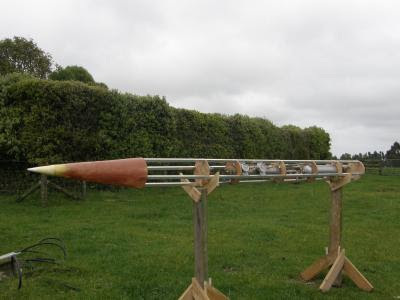 Kiwi 2 Space has started construction of their test air frame, called "Psycho." "Psycho was intended as a first liquid rocket flying test bed, but this little beast is still yet to be flown. All plumbing has been completed, with only avionics and recovery needing to be implemented. It is hoped that this will now serve as a static test bed and hopefully fly one day soon. It is of bulkhead and stringer construction with a length of 3m and diameter of 203.2mm and originally intended for a 1334N of thurst (300lbf) lox/kero engine." "!!! 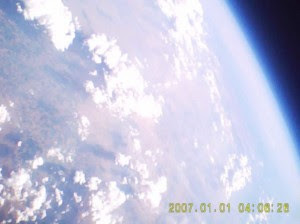 News, Kiwi 2 Space is no longer seeking the N-Prize competition (September 2011) !!! Well the prize deadline has come and gone and been extended another year but is beyond our reach, I've always known it was going to be hard but it was a good initiative to get off the couch to go do something which could make a difference. And yet still could with some ideas I've had over the years. I've always been fascinated by the pump problem that smaller rockets have, more so the complexity etc. for such a small system hence why pressure fed is what you see a lot in smaller sounding rockets. I very much like Flometrics pistonless pump and think its a great idea, but every where I look I see more and more stuff electric, which is the way the world seems to be going, and with the batteries and motors these days, you have some pretty good products on the market. Its not a new idea but a small electric turbo pump for rockets is one thing I'd like to investigate more, I'm no pump man so I'm not sure what I'm getting myself into but if someone could come up with something small and powerfull like this it could change the way for smaller nano sate launchers etc. So this is one future aspiration along with many other things. But the N-Prize has been good in opening my mind and eyes on the world of amateur experimental rocketry and space in general. 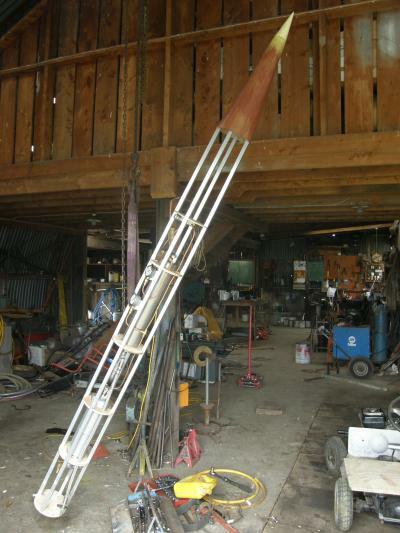 I will still continue to build my big rocket, but now at my own pace." As I stated previously, these projects are more important than just the N Prize. This is exactly the kind of little rocket that I mentioned earlier. An L motor bi-propellant rocket in a soda can would offer very high (ca .9) mass fractions and in near space, would just eat up mach numbers. But it is easy to say that, much harder to actually do it. This would be a two stage rocket, I am not exactly certain where this rocket would start (from a balloon?) If you can get L impulse in the first stage, and J in the upper, you would do well from 100,000 feet. Space certainly. Probably not orbit even under ideal circumstances. "This is the second burn test of the WikiSat second stage. This stage is formed by four granes inside a steel combustion chamber. The nozzle made in aluminum resisted but burned in few milliseconds. The igniter were four small bulbs with black powder inside. Safety margins were respected by WikiSat team in any moment." Sadly, the team is using black powder in this upper stage. They are clustering four D motors inside of a soda can. This is almost the opposite of what I was discussing above. These motors have ultra-poor mass fractions, will be hard to ignite in the cold of space, and wont work well if they are burning inside of a can. Why bother burning them in a can and then pushing the exhaust through a second nozzle? It doesn't make much sense. Just getting the can to survive the pressure and heat of a good efficient burn is going to be hard, I would say basically impossible. (Maybe a layer of filament CF or FG would do it if wrapped around the outside.) But more importantly, it is not needed. 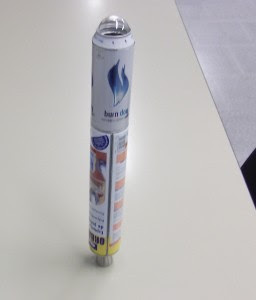 Use soda cans for pressure-fed bi-propellant rockets or hybrid rockets. Or use a conventional rocket motor (such as a 54mm I motor if these stubby dimensions interest you) instead and enjoy vastly better ISP and mass fractions, not to mention reliability. Granted, igniting such a rocket at high altitude will require a burst disk of some sort and ideally a head-end ignition system. "That was a try to measure the lateral nozzle thrust but the second stage exploded bue to a failure in the after bulkhead. The micro-valve was blocked. We decided to use cold gas for the first stage control and to use spinning stabilization for the second stage." "This test was a C1 + acetone burn test inside a Cocacola ZERO can, a bulkhead and a 11 mm hole. A new bulkhead method was tested. Propellant was not solid (Like the sand). Pressure increased due to the not uniform burning area. Bulkheat exploded and propellant was blowed out. The can could be reused. No damages in the flange were found. I see great work with balloons and electronics, but some really confusing rocketry. This team needs to revisit their plans if they are using solid propellants (of any kind) inside of an aluminum can. The can needs to be tested to the operating pressure - hundreds of PSI in most cases, as well as the operating temperatures. The overall mass fraction, isp, and total impulse need to be very good in a satellite launcher. 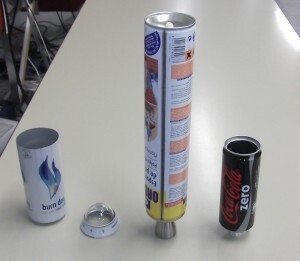 Even my proposed "L in a soda can" motors would not be enough to launch a satellite from a rockoon without many stages. And 4x D12 motors in a soda can, clearly burning under sub-optimal conditions, are not going to cut it. The best bet would be to custom make steel casings of proper strength and load them with high quality APCP. Or better yet, to save time and money, modify an already made CTI motor such as the N 10,000 and fly it from a rockoon. That is one of your best bets for a space flight at this time, short of using much larger and more expensive R,S, or T class motors.